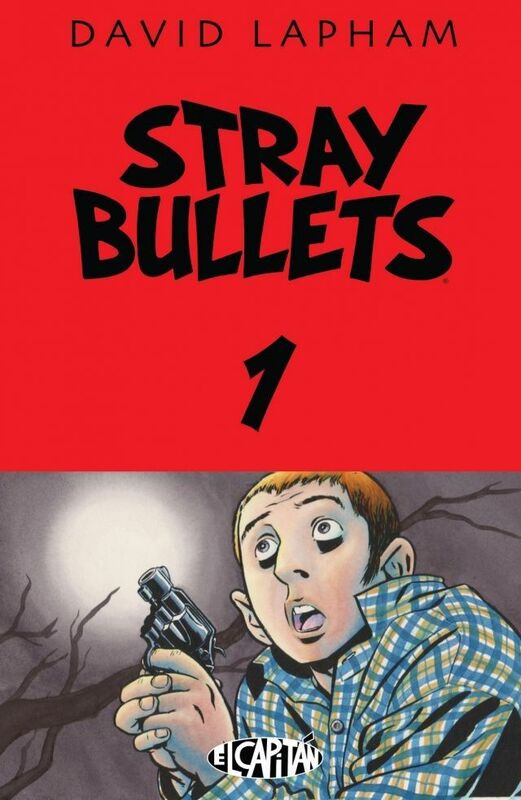 Funnybook Heart of Darkness: If You Could Only Have Ten Comics, What Would They Be? – Dork Forty! 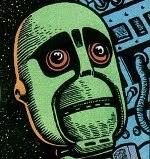 Home » Comic Books » Funnybook Heart of Darkness: If You Could Only Have Ten Comics, What Would They Be? 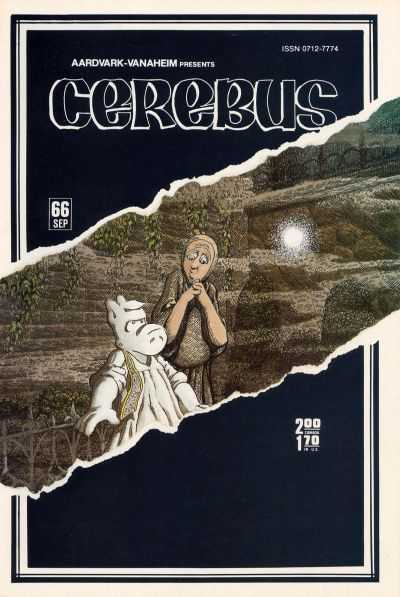 Funnybook Heart of Darkness: If You Could Only Have Ten Comics, What Would They Be? So I know I promised the second part of our look at Alan Moore’s Twilight of the Superheroes this week, but well… There’ve been some technical difficulties. I had that column almost entirely written, but it was lost in a hard drive malfunction, and I don’t have time to recreate it tonight. So instead, I thought I’d plug in a question a friend asked last week on social media that completely distracted me for two or three days: If you could only have ten single funnybooks in your collection, what would they be? That’s ten single-issue stories that you love so much you’d be willing to make them the entirety of your collection, if such a limitation were placed upon you by the Funnybook Gods. It’s harder than it sounds. MUCH harder. For one thing, I don’t think in terms of single issues much anymore. I think of runs and storylines and bigger stuff. Most of my favorite comics as an adult are written that way, and so they’re immediately disqualified from this list. So I had to think back, and dig deep. Look for stories and moments (even lines of dialogue) that made an impression on me. Things I’ve remembered over time. If they’re still in my head, I figure there must be a reason for it, after all. So what follows is my list of single issues, in roughly the order in which I read them. Most of this was written for an audience of friends, so I’ve cleaned it up and maybe gone on a bit longer than I did originally. But for the most part, this is what I posted in my friend’s thread. Because we are huge nerds. But probably, so are you, if you’re reading this blog at all. So… Enjoy! The first comic I ever bought. But that’s only half the reason it’s on my list. 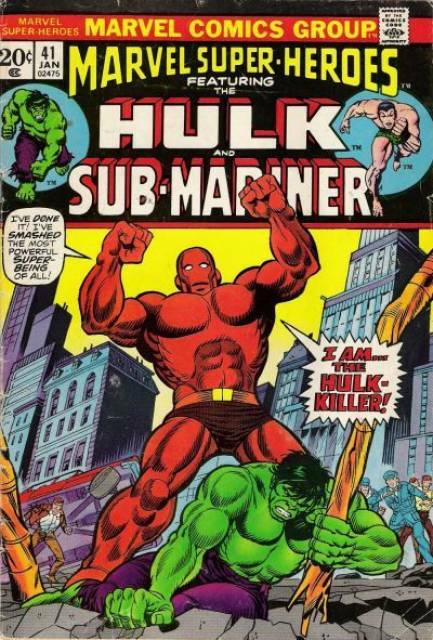 This book was reprinting Hulk and Submariner stories that, honestly, aren’t very good. But it does feature maybe my favorite Submariner moment ever: he’s been dogpiled by a bunch of soldiers, and as he tosses them off with a flex of his mighty muscles, he shouts, “You dare profane my princely person with your clutching hands?! AWAY, worthless rabble! IMPERIOUS REX!” So arrogant! So hysterical! But it also introduced me to the concept of the anti-hero, something that’s intrigued me ever since. …and long-time readers know that story holds a special place in my heart. But I think this one edges out even Thingbeard for sheer damn insanity. 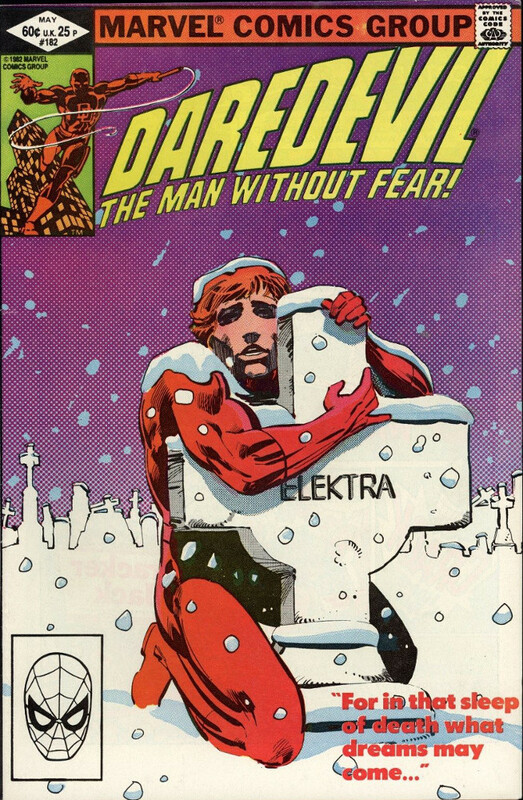 The issue after Elektra dies. Daredevil becomes convinced she’s still alive, and tries to dig up her body. This was a formative funnybook for me. 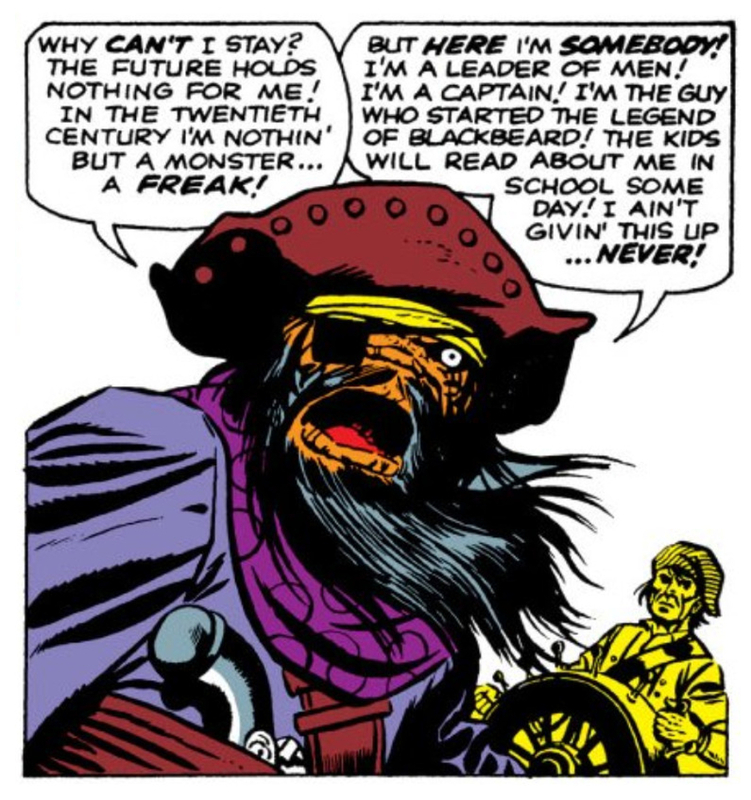 I’d never seen a super hero lose it so completely before (not even Thingbeard), and it fascinated me. Probably the first noir story I ever read, when I was really old enough to understand the genre, and I’ve loved Frank Miller for it ever since. This one’s technically a cheat. 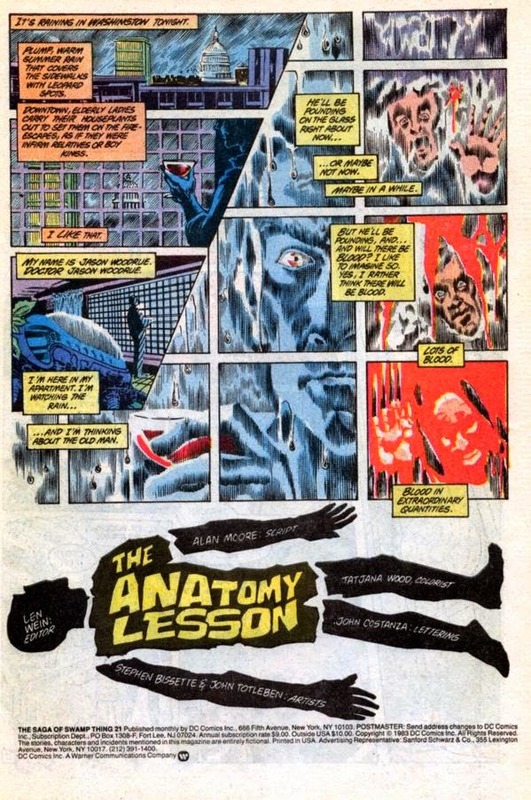 It’s technically the second part of Alan Moore’s first four-or-five part storyline on Swamp Thing. But here’s the thing: you don’t really need the rest of it to appreciate this single issue. Part one is so unnecessary, in fact, that it was left out of the early trade collections of this story. And the later issues really function as a separate, but tightly connected, story unto themselves. 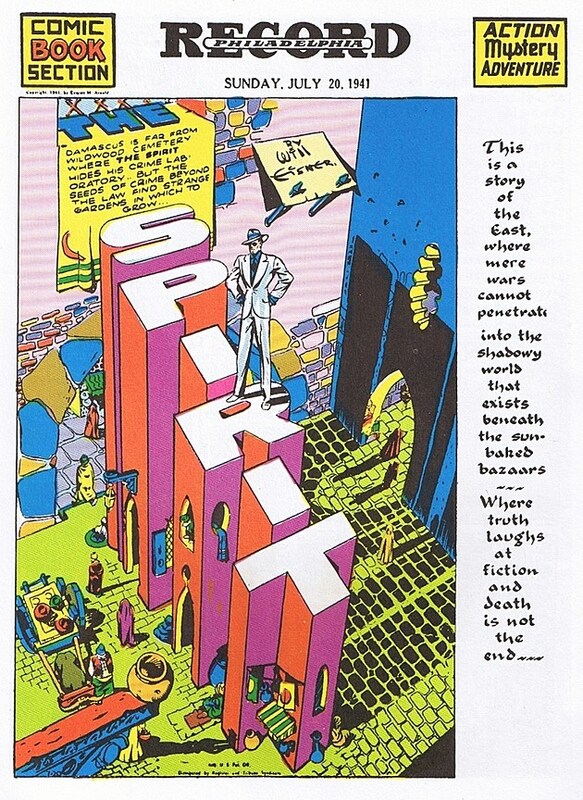 But this issue… This issue is where, as a friend of mine put it, Alan Moore flipped the tables over. He turned Swamp Thing’s origin on its head, revealing that he’s not a MAN who turned into a PLANT, but is instead a PLANT that only THINKS it’s a man. Which sounds ludicrous, just saying it baldly like that. But it’s not the idea that’s so mind-blowing. It’s how Moore presents that idea to you. He tells the story so well that the idea is transformed. It BECOMES mind-blowing through sheer force of will. This is (in part) what he’s talking about when he says that creation is magic. Through the power of storytelling, he turned lead into gold. And that transformation, though I didn’t realize it at the time, also caused a transformation in me. It made me demand more from my entertainment than comfortable formulas. Which has left me with fewer things to read and watch, but has greatly increased my appreciation of the stuff I do like. In other words, this comic is where the Dork Forty was really born. 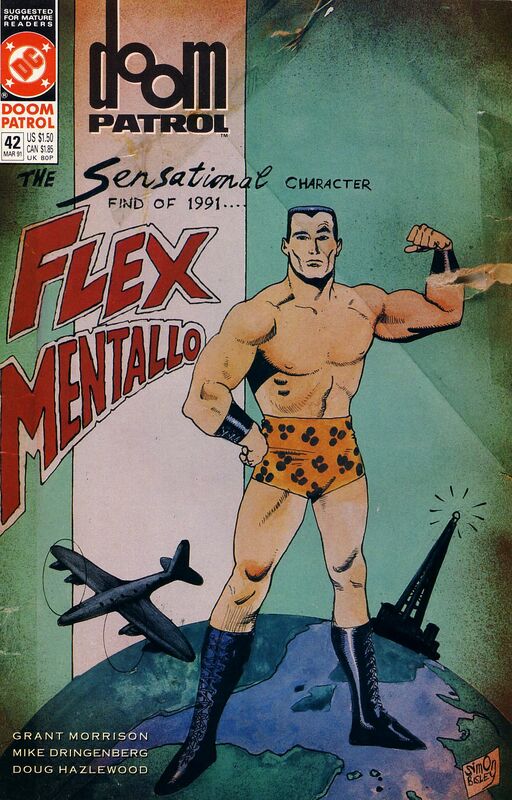 The secret origin of Flex Mentallo, Man of Muscle Mystery! Answering a mysterious mail-in muscle building program (Muscle Mystery for You! ), a 98-pound weakling becomes the mighty FLEX MENTALLO, able to channel mysterious energies through the simple flexing of his biceps! It all ends in tragedy, though, when an attempt to “flex the Pentagon round” destroys Flex’s mind, and he winds up (much like the Submariner) a forgotten derelict. All the pitch-perfect weirdness that makes me love Grant Morrison comics, inside one cover. Two small-time crooks are tasked with disposing of the body in their trunk. But the younger of the two snaps, and their car slowly fills up with more and more corpses. The first in a long series of great done-in-one crime comics by David Lapham, about the affects of crime on innocent bystanders. I wanted a comic published this century on my list somewhere, and as I said at the outset, that was problematic, because most of my modern favorites don’t work in the realm of single-issue stories. Sure, there’s some stuff. The Pizza Dog issue of Fraction and Aja’s Hawkeye, for instance. 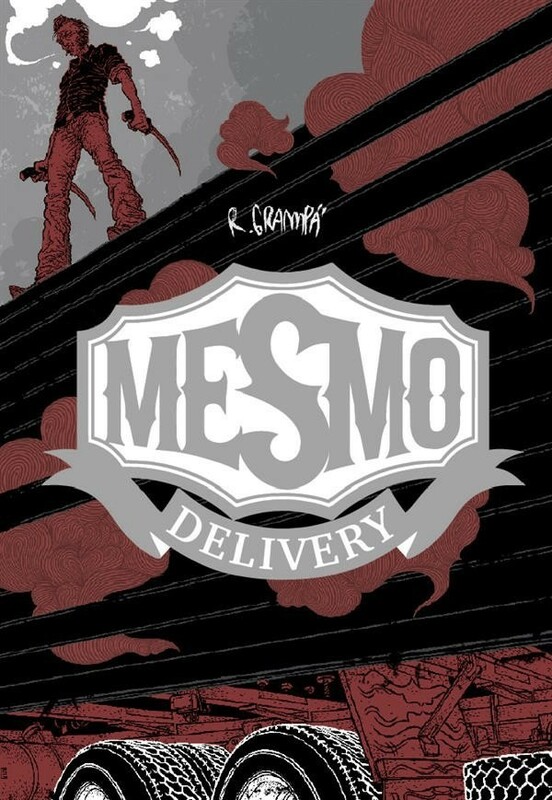 But if I’m looking for single issues that really made an impact, I decided I had to go with Rafael Grampa’s Mesmo Delivery, a 50-page special featuring the story of two truck drivers who get into a bar brawl of epic proportions. 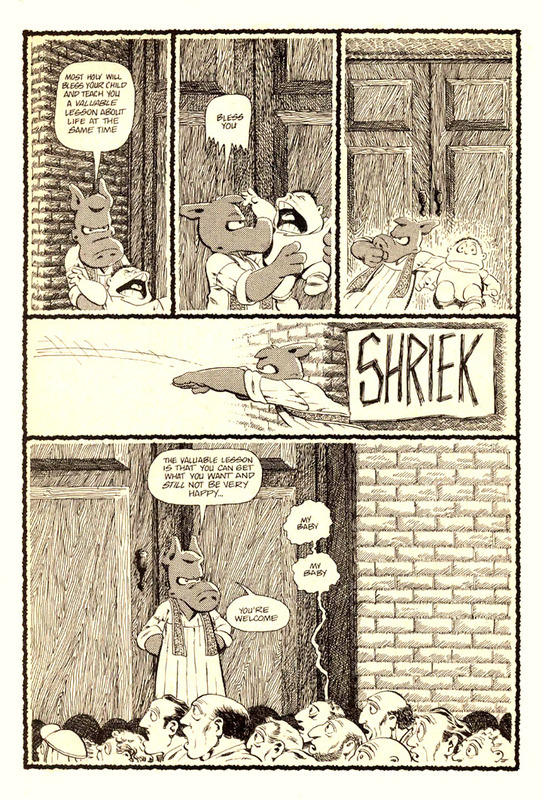 Funny, bloody, and horrifically violent, Mesmo Delivery was probably the first of the modern breed of art-driven comics that refreshed my love of comics as a visual medium, after a decade or two of being concerned primarily with the writing. Don’t get me wrong; I’ve always appreciated good art. But the 1990s made me wary of books driven primarily by the visuals, and it took something this good to convince me that it could work. 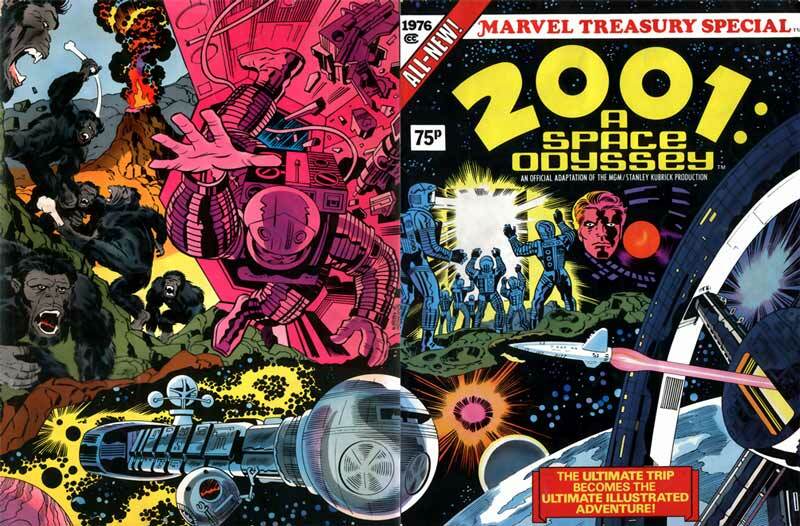 There had to be a 1970s Jack Kirby comic on here somewhere, and since I couldn’t choose between all the various single issues I love, I went with the biggest and weirdest Kirby comic ever. He took the story and themes of Stanley Kubrick’s film and made them his own, full of heroic bluster and Kirby Krackle and everything else we’ve come to associate with the King. The result is an adaptation that’s not the most faithful you’ll ever see. But ultimately, it’s really no further from the Kubrick film than the film was from Arthur C. Clarke’s novel. So it’s all good. 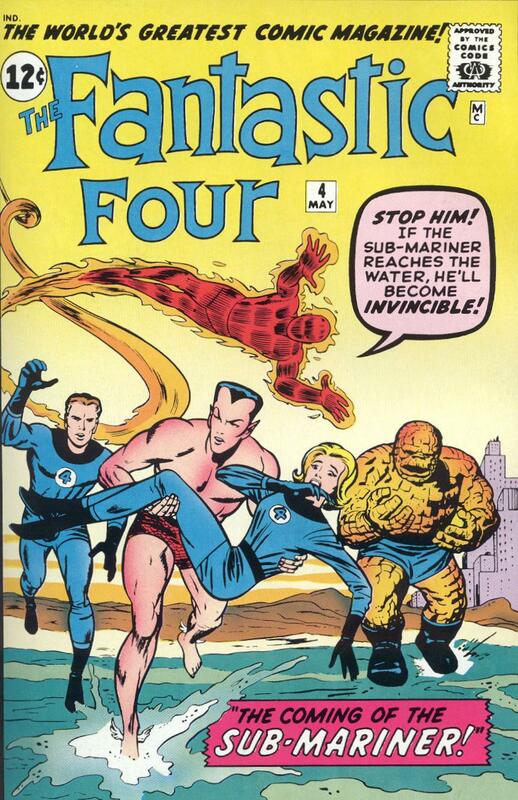 It’s certainly entertaining, and one of the Kirbiest Kirby Komics ever. And one of the last on my list, because I came to major Kirby fandom rather late, and it took me a while to find this thing. Because it’s a licensed book, it’s unlikely to be reprinted. And even if it is, I doubt it’ll ever be presented at this size again. This didn’t make the final official list because it’s not a single-issue story. 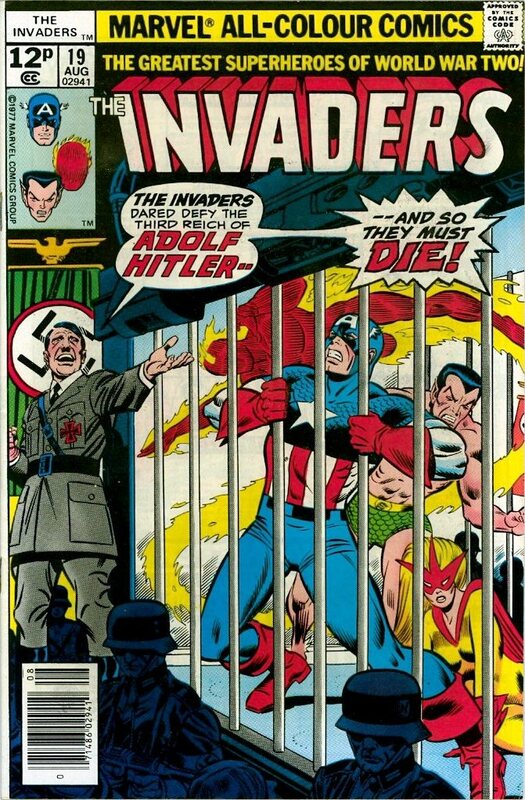 But it’s awesome, and features a moment I have never forgotten in the 40 years since I first read it: Hitler has captured the Invaders, and the Destroyer comes to the rescue under the mask of his father: Union Jack. The original Union Jack fought in WWI, where Hitler (then a young member of the German army) saw him in action. So when Hitler sees the new Union Jack, he lets out a line of dialogue that is just pure gold: [BadGermanAccent] “Gott in Himmel! It is a ghost! A ghost from the past!” [/BadGermanAccent] SO. DAMN. FUNNY. Even when I was a kid. Funnybook grandiosity doesn’t get much better than that. 3 Comments on Funnybook Heart of Darkness: If You Could Only Have Ten Comics, What Would They Be? Interesting choices, but I certainly appreciate them, especially your decision to include an issue from Morrison’s DP run. These things are always hard for me to pick for various reasons, be it top favorite comics, albums, bands and singers, etc, so good on ya’ for being brave enough to even out together a list like this. It’s really an impossible task, especially when you try to think of only done-in-one stories. So I just went with the stuff that’s stuck in my memory. Ask me again in six months, and I might come up with a different list. I’m already second-guessing my choice of Miller Daredevil issues (the Russian Roulette issue also looms large), and someone reminded me just this morning of the Batman “Mad Love” special. Oooh, those really are good choices. Yeah I hear you, because you’re stuck having to either choose from childhood favorites, or modern day classics.